In 1852, the British troopship H.M.S. Birkenhead was traveling to South Africa when she hit a ledge and foundered. On board were more than seven hundred men, women, and children. With only twenty minutes left before she would sink, the decision was made to place all women and children aboard the few life boats. The men would remain behind and face the man-eating sharks circling the disaster. Hundreds of men drowned or were eaten alive in full view of their children, but not a single woman or child perished that day. In past years, this story was known by every schoolboy and girl. Now, you can learn about the Birkenhead through this stirring collection of survivor accounts. What this country needs is a few good men — husbands and fathers who are willing to love and lead their households with manly resolve and godly vision. Frankly, the Church needs these men every bit as much as the rest of the country. We are experiencing a national crisis of manhood of epidemic proportions. Absent a revival of fatherhood, we can expect to see an ever-increasing rise in the number of effeminate boys and masculine women, as well as the breakdown of the Christian family as it is defined in Holy Scripture. What we desperately need today are men who will be family men and family leaders. But how? For more than ten years, Philip Lancaster has been instilling hope, and calling fathers to their rightful duties as family prophets, priests, protectors, and providers. He has emerged as one of the most articulate and theologically-sound defenders of the biblical family. Through his magazine Patriarch, Phil has reached thousands with both the vision and the tools necessary for family revival. Now, in his first book, Phil lays — in simple, easy-to-understand concepts — the biblical foundation necessary for men to turn their hearts to home and change the world. 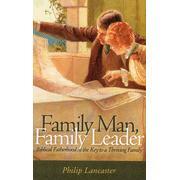 Family Man, Family Leader first presents the vision of biblical household leadership. Next, it addresses the many practical issues necessary for achieving victory as a man, from learning and acting upon God’s priorities, to decision-making as a father, to growing in oneness with your wife, to personal accountability before the Lord and victory over secret sins. Whether you are a veteran visionary father, or a dad just beginning the journey of patriarchy, we hope you find Family Man, Family Leader to be a source of inspiration and practical help. Paperback. Approx. 320 pgs. The father and son relationship is one of the defining relationships in the universe. In fact, before there was a universe, there was the eternal Father who loved the eternal Son. We should not be surprised, therefore, that Satan has reserved his most fiery darts to alienate Christian fathers from their sons. The best way to destroy a nation or to render the Church ineffective is to destroy the legacy of multi-generational faithfulness which God intends for covenant-keeping men and their progeny. 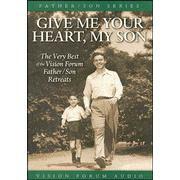 With this in mind, Vision Forum Ministries launched the Vision Forum Father/Son Retreats. Four years later, over 2,500 fathers and sons have graduated from this special three-day retreat designed to build a biblical vision for unity and love between the men of a family. We have received hundreds of testimonies of lives that were changed and relationships that were restored at these retreats. Give Me Your Heart My Son contains some of the highlights of past retreats. Speakers featured in this series include evangelist and historical reenactor Richard “Little Bear” Wheeler, Norm Wakefield of Elijah Ministries, Bob Welch of Bible Teaching Ministries, Pastor S.M. Davis and Doug Phillips. This handsome album houses eight cassettes, 60-90 minutes each. God appears to be touching the hearts of a growing number of Christian fathers with a hunger to learn more about biblical manhood. This quiet revival is taking place in homes where teary-eyed fathers are standing before their wives and children, repenting for their lack of vision and leadership, and recommitting themselves to God’s priorities for men. With this revival comes the awareness that Christian men need to make dramatic changes in their lives; changes which reflect a biblical re-examination of the way our fallen culture approaches family, work, finances, education, citizenship, etc. The goal of these conference tapes is to encourage men to see “the big picture” of biblical manhood. Topics include: the meaning of patriarchy, developing a multi-generational vision, busy fathers as family shepherds, preparing sons for marriage and life purpose, biblical discipline, family worship, and much more! With Phil Lancaster, Doug Phillips, and John Thompson. Approx. 8 hours playing time. One reason men lack vision is because they lack poetry in their lives. Men no longer sing or recite inspirational verse. Our boys are no longer required to memorize the great psalms, hymns, and poems of Christian manhood. This should come as no surprise. The 20th century has wreaked havoc upon chivalry and manhood. The transformation of poetry from the ennobling to the coarse, the banal, or the irrelevent is as much a sign of our national loss of manhood as it is of the decline of decency and civilization. But poetry is essential to a man's life. We should never forget that God chose to communicate through the language of poetry. A large portion of the Scripture from Psalms to The Song of Solomon- even the book of Isaiah in the original language-was written in verse. Why? Because poetry and song allow us to use the beauty of language to paint mental images of victory, of devotion, and of the beauty of life in Jesus Christ. 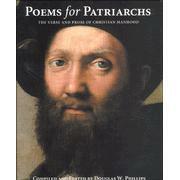 In Poems for Patriarchs, Doug Phillips has compiled favorite inspirational and vision communicating selections. This collection includes poems and prose both obscure and popular, but selected because of the profound way they speak to the most important issues in a man's life. They are neither fluffy nor frilly, foppish nor foolish, but virile and often sage, both as to their composition and character. Each chapter in the book contains a generous number of selections, some new, some ancient, but all designed to address the various biblical roles, relationships and seasons in a man's life, from early boyhood to his twilight years. On the battlefield, he was brilliant, audacious, and unflinchingly courageous, hence the nickname "Stonewall." This man of God was also a church deacon and devoted husband. Your students can meet the real Thomas Jackson as they read the letters he wrote to his wife, Anna---letters that still reflect a model of godly leadership and covenant faithfulness. Includes a list of his maxims. 160 pages, softcover. Polls indicate that the typical high school male laughs at the idea of giving up his seat on a lifeboat to help a woman or child. In a society that promotes "survival of the fittest," aborts its young, and thrives on androgyny, this should not surprise us, but it should grieve our hearts. 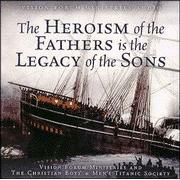 This is why we must tell the story of the men of the Titanic, their remarkable sacrifice, and the legacy of heroism which they inspired. Forget about the Hollywood movie, the true story of the R.M.S Titanic is far more inspiring. A goal of this tape is to encourage your sons to honor their mothers and protect their sisters. Approx. 60 min. 1 audiocassette. What causes men to act with nobility and heroism? What is the link between fatherhood and leadership in times of crisis? In a never-to-be-repeated special evening dedicated to 150 years of heroic manhood, Doug Phillips answers these questions and presents the remarkable story of multi-generational fatherhood and Christian sacrifice from Teddy Roosevelt to Lord Baden Powell, from the Birkenhead to the Titanic, from 9-11 hero Todd Beamer to the remarkable story of home school heroes Joshua and Noelle Goforth. Join Doug and an ensemble of speakers for a night to remember as they celebrate the anniversaries of the sinking of the Titanic and the Birkenhead, as part of a gala event for the Baby William Fund, which is dedicated to helping special children in times of need. 1.5 hrs. of audio on 2 CDs. A 2-CD Collector's Edition Audio Album with Douglas W. Phillips and Other Guests. 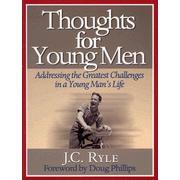 Twenty-first century Christian boys have much to learn from boys of the past. 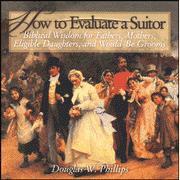 Issues of courtesy to women, sacrifice, and vision are critical to raising modern boys. 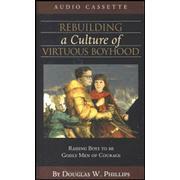 Our goal must be to move beyond the pretty platitudes and to aspire to rebuilding an entire culture of virtuous boyhood, such that every aspect of a young man's life is preparation for chivalrous leadership in the name of Jesus Christ. 1 cassette. 60 minutes. 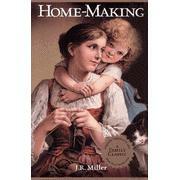 The most neglected group in the Church is children of single-mother homes. It is a biblical obligation to help such mothers stay off welfare and out of the workforce, and to enable them to home educate their children. This is true religion. By Doug Phillips. Approx. 60 min. 1 audiocassette. There are four great temptations that plague most young men: sloth, lust, love of pleasure, and peer pressure. J.C. Ryle, the last of the great Puritans, tackles each of these subjects with a tenderness and tact which is unsurpassed. 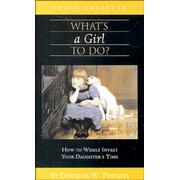 First written toward the end of the nineteenth century, it remains to this day the most relevant and helpful book on the subject in print. All parents want their boys to become respectful, courteous young men---and here's just the help children need! Using godly wisdom and whimsical illustrations, the Barneses teach your boys the basics of proper manners, covering everything from appropriate language to table etiquette, sportsmanship, good grooming, hygiene, and more. Ages 4 to 7. 32 pages, hardcover from Harvest.